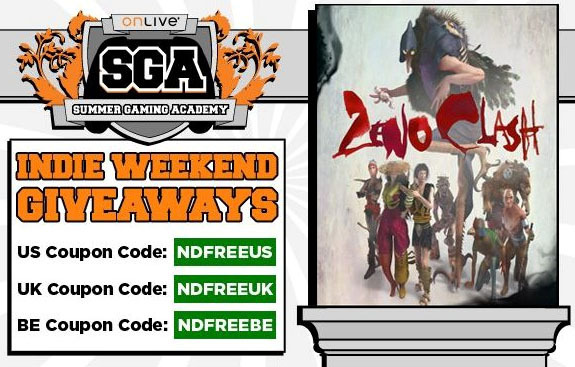 Help OnLive reach their goal of 1000 shares of the free Zeno Clash Facebook announcement and they’ll unlock not one, but TWO free indie games next weekend. And don't forget to like OnLive on Facebook for giving you free games. 1. Get your code from here or from the OnLive Facebook page – be sure to like the page while you are there! 2. If you don’t have one create an OnLive account for free (US)(UK)(BE). 3. Download, Install and sign into the OnLive Application. Select Zeno Clash (it is a featured game). Select “Full PlayPass” and click “Next”. Enter in Promo Code (from step #1), apply it, select “Purchase”. Start Playing! (Your game will be in your “My Games” tab from now on). Enjoy your stay in Zenozoik! We hear the creatures can be rowdy around this time of year.